The latest Online Banking Report: 2011 to 2020 Online & Mobile Banking Forecast is now available. It was mailed over the weekend to all OBR subscribers. It’s also available online here. There’s no charge for current subscribers; others may download it immediately for US$495. The report includes our latest 10-year online & mobile banking and bill-pay forecast. While our reading of the tea leaves is unlikely to be perfect, it seems clear that the demand for online banking in the United States has reached a plateau (note 1); in fact, we are likely within a year or two of online banking penetration peaking and slowly heading down. How could that be? Mobile of course. In fact, through the end of 2020, we project an increase of 40 to 45 million U.S. households using mobile banking, to a total of nearly 60 million. During the same period, online banking penetration is actually expected to drop by a few million households. If we are right, sometime near the end of the decade mobile banking will surpass online (note 2), although by then, the two will look pretty similar. The report also includes a revised 10-year forecast for U.S. peer-to-peer lending. After more than doubling in 2010, we expect continued strong growth of around 40% compounded annually through 2020. 1. The penetration of online banking into U.S. households is relatively flat going forward. However, because each households accesses a larger number of financial accounts, growth at individual financial institutions is still growing on average. 2. Forecast is for the United States. Mobile has already surpassed all types of banking in some developing countries. 3. Perhaps this can be explained by the necessary focus of financial institutions on getting through the global banking crisis beginning in 2008. Ever since Compete came along with its free Web traffic estimates, my work life has been much improved. Now, every time I review a startup or financial company, I check out their website traffic from Compete’s free service to give me a sense of how big the company is and how fast they are growing. But I’d also always coveted the Pro version, which unlocks a bunch more detail on each website, including two years of historical traffic data. So I took the plunge today and upgraded to Pro. One of the first things I did with my newfound data trove was to highlight the financial institutions, insurance, and investment companies on the list of the 1,000 busiest websites (based on U.S. traffic). There were 29 FI websites, representing 26 unique companies. PayPal was the top financial company with 30 million unique visitors, making it the 25th most visited site on the Internet. Chase was the largest commercial bank, just 2 million higher than Bank of America. Quick. What comes to mind when you envision mobile banking? I’m guessing most of you pictured a mobile website or shiny new app running on a recent iPhone, Blackberry, Android or other smartphone. And if mobile banking was used only by techies, that would be about right. But banking is used by just about everyone, and everyone still doesn’t have a smartphone and Internet data plan. According to the latest study out of Pew Internet (note 1), 82% of U.S. adults have a cell phone (and another 6% of the total live in a household where someone else owns one). And 72% of those cell phone owners use text messaging while only 38% access the Internet through their phone. And only 60% of the mobile-Internet users, or 23% of all cell phone users, are frequent users, accessing the Internet 3 or more times per week (note 2). So the text-banking gap is 49% (72 less 23) or half of all cell phone users. Those are the people that use text messaging but do not regularly access the Internet through their phones. Another way to think of it, the non-Internet-using segment is more than twice the size of the mobile-Internet-using group. Or more simply, text users outnumber (frequent) mobile Internet users 3 to 1. Bottom line: Don’t overlook the mainstream text-message group for both alerts and balance inquiries. And make sure your marketing and educational material speaks to the sizable segment that could care less about your new iPhone app and just wants to know how to txt for their bal. 1. Adult data compiled via telephone interviews in May 2010. N = 2,252. 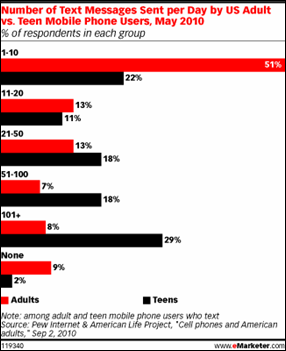 Teen data is from a year ago in a telephone survey of 800 teens (age 12-17) fielded June through Sept. 2009. 2. In comparison, text-message usage is crazy high (see eMarketer graph of the Pew Internet data inset). According to the Pew data, adult (18+) text-message users send/receive almost 40 text messages a day. Of course, that’s nothing compared to the thumb-weary, under-18 crowd who send/receive an average of 110 messages per day. Side note: The wording on the question asks for the number of messages sent AND received, so one exchange, text out and reply back, should only count as one message. But I’m guessing respondents are thinking of this more as “sent OR received” so that each exchange counts as two messages. I also suspect the kids are over-estimating their usage quite a bit, wanting to wow the researchers with their uber-connectedness. But the bottom line is the same: Teens have embraced texting, and adults have caught the bug as well. 3. For more info on mobile banking, see our mobile banking series in Online Banking Report. I don’t know if it has anything to do with the publicity Mint received in recent months following its acquisition by Intuit or the promotional links from Quicken’s website, but the online PFM juggernaut just blew the roof off its monthly traffic. According to Compete, in January, Mint had 1.7 million unique visitors, 600,000 more than a year earlier. To provide a little context, not counting the Dec. to April tax-time traffic spike at Intuit, Mint’s traffic is now slightly HIGHER than that of its parent company (see chart #1 below). That gives you a little understanding of why Intuit coughed up $170 million for the startup. Another way to look at it: Mint now has as much traffic as the tenth largest U.S. retail bank, BB&T (see chart #2). The interesting question for 2010: Now that Mint is part of the establishment, what startup will rise up to challenge it? Or will the banks, back on a path to profitability, fill the need going forward? Note: For more information on the PFM space, see our Online Banking Report on Personal Finance Features. It’s always difficult to gauge actual consumer demand for new services. Traditional market research, while providing some broad intent data (e.g., “yeah, that sounds like something I might buy“), doesn’t really do a very good job in telling you whether real customers will use the service. The problem is that in the real world, customers have real concerns about new products and most are unwilling to spend very much time learning about them. So it’s always great to find financial institutions willing to share usage data on their online or mobile services. This week, First General Credit Union wins our undying gratitude (and a free subscription to Netbanker) by revealing its person-to-person payments numbers in the latest issue of Credit Union Journal. 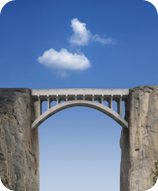 Analysis: The credit union says it hasn’t promoted the P2P feature, which is offered free of charge. It’s not even mentioned on its website, except on slide 22 of its online demo. So this isn’t a representative sample for a financial institution looking to drive usage to the product. However, a 2% penetration (of online/mobile customers) is along the lines of what we expect this year nationwide. Longer-term, we expect usage to grow at least 10-fold from that level (see note below). Note: For more information on P2P payments including a 15-year usage forecast, see our recent Online Banking Report: Making the Case for P2P Payments (published Dec. 2009). 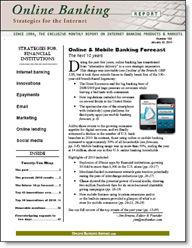 The latest Online Banking Report: 2010 to 2019 Online & Mobile Banking Forecast is now available. It will mail next week to OBR subscribers. It’s also available online here. There’s no charge for current subscribers; others may download it immediately for US$495. The report includes our latest 10-year online banking and bill pay forecast. For the third year in a row, the forecast was bumped up a few percentage points to reflect a more robust outlook for adoption, thanks primarily to mobile banking. For example, we now project 73 million U.S. households banking and/or paying bills by online or via mobile in 2013 (note 1). The report also includes a revised 10-year forecast for U.S. peer-to-peer lending. After experiencing a 30% decline in 2009, we expect healthy growth next year with a record amount of loan originations. The report includes a summary of the top ten innovations of the past year, including the surge in mobile banking usage, the amazing tools coming out of the iTunes App Store, and of course, the surprising adoption of Twitter, with nearly 1000 financial institutions worldwide tapping the real-time info stream (note 4). We also listed the top 25 innovations of the decade topped by the invention of simple online payments by PayPal ten years ago (note 2) and the advent of modern mobile banking (note 3) which appeared in the United States just three years ago at Citibank (powered by mFoundry) and BancorpSouth (powered by Firethorn). 1. Mobile banking access is included in the overall online banking numbers, but it’s also shown as a separate line item. 2. Technically, this launched in mid-Nov. 1999, but that seems close enough to 2000 to make the all-decade list. 3. There were a number of earlier mobile efforts, including from Citibank, in the 1999 to 2001 period, but they were ahead of their time and shuttered in 2001/2002 for lack of interest. The “modern era” began in 2007 in the United States. 4. Follow them all on Twitter via The Financial Brand’s financial institution lists. 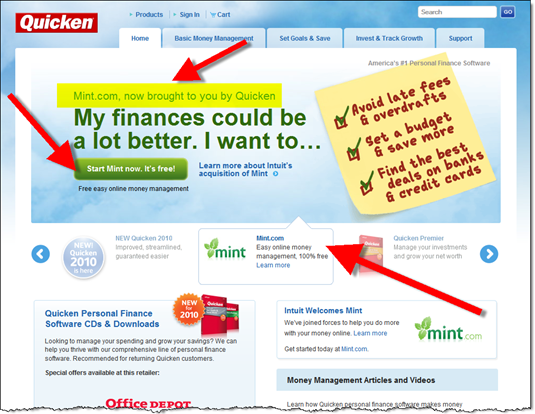 If anyone still wondered how serious Intuit is about incorporating the Mint brand into its portfolio after its $170 million acquisition, take a look at the latest version of the Quicken sales site. Mint is prominently featured (see first screenshot below), especially if you scroll one “ad spot” over (second screenshot). 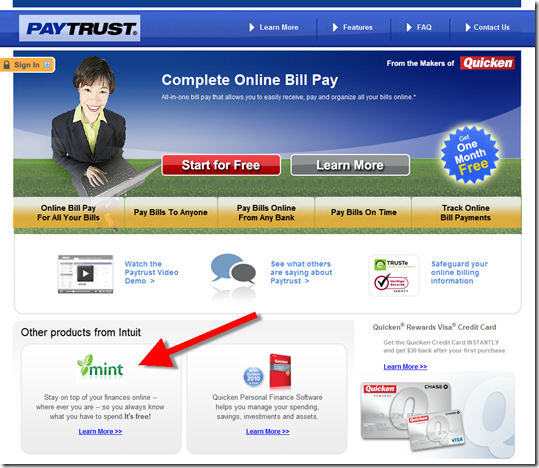 I also found Mint mentioned at PayTrust, Intuit’s bill management site (third screenshot). 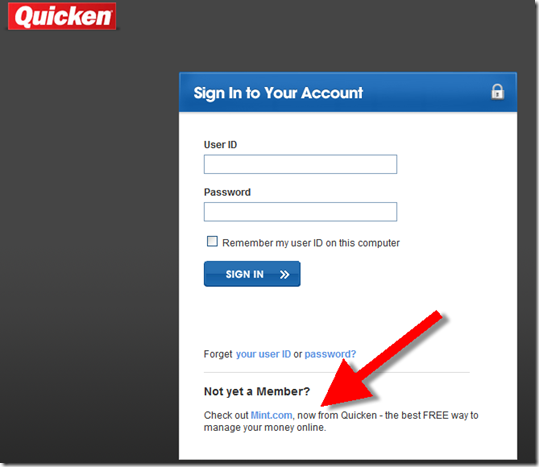 There’s even a small plug on the Quicken Online login page (fourth screenshot). 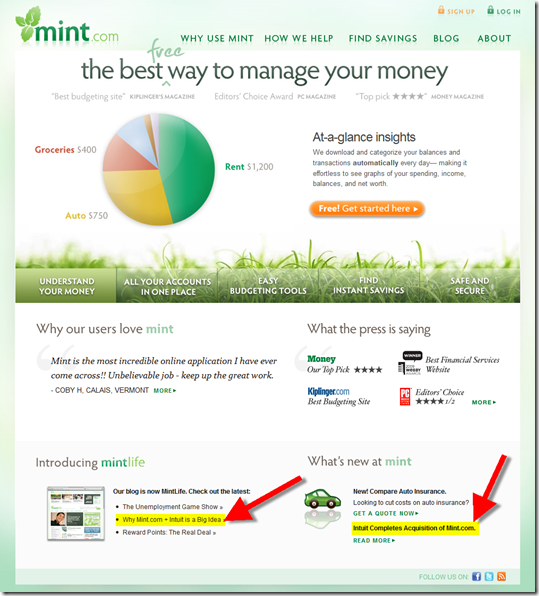 However, on Mint’s site the co-branding is not reciprocated. 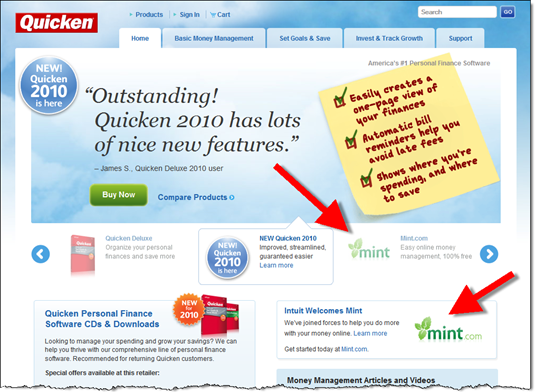 Quicken is not mentioned at all and Intuit is relegated to 8-point type at the bottom of the page (fourth screenshot). The latest traffic figures from Compete support the theory that Intuit is de-emphasizing Quicken Online in favor of Mint. Traffic to <quicken.intuit.com> fell 50% in November to about 400,000, while Mint held steady at about 3x that, 1.2 million unique visitors. Intuit mentioned twice at bottom of page (yellow highlight is mine). Some interesting data was released today from the American Bankers Association (press release). According to its annual telephone survey of 1000 U.S. consumers, online/Internet banking is now the most common banking method among U.S. consumers (note 1). Question: Which banking method do you use most often? 1. Remember, this reflects households willing to take a telephone survey but who may or may not use the Internet. If you are surprised to see online usage trailing branch usage until this year, you may be thinking of research results from other surveys of online users, who have long preferred online banking over other delivery channels. 2. Unlike the ABA release, I’ve eliminated all the Don’t know, Unsure, and Other responses from the totals. So, the figures above represent the delivery-channel penetration of customers who named a single one from the list read to them. 3. The changes in mail, telephone and mobile seem odd. It’s possible that the way the question was constructed accounts for these counter-intuitive results in the lesser-cited categories. In 2009, respondents were given two new choices: “other” and “none of these.” In 2008, without those two bail-out choices, more customers chose one of the six channels read to them over the phone. In 2008, 110 respondents out of 1000 said don’t know, unsure, etc. In 2009, that number doubled to 226 respondents out of 1002. 4. Image credit: Bank of Hawaii. 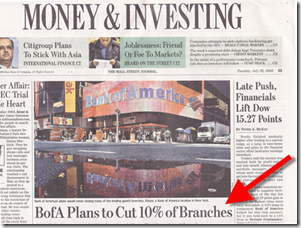 The article, which has been picked up by nearly 100 news sites in the past 24 hours, reported that Bank of America was planning on reducing the size of its 6,000-branch network. There were no details on timing or whether the bank was retreating from certain markets or was simply pruning overlapping branches broadly. McGee says the bank is going through a 3-year evaluation process that could result in fewer branches, but that no particular number is targeted. He says customers’ changing habits are driving the process. Nearly 50% of deposits are made in ATMs…up amazingly from 33% six months ago. The bank didn’t say whether this was NUMBER of deposits or VALUE of deposits, but it’s likely the former. Also, it’s unclear if remote deposits made via scanner are included in the total. That new technology is making a significant dent in branch-based deposits at many financial institutions. 2.8 million customers are now using the mobile channel which was introduced in mid-2007. That’s an average of about 120,000 new customer per month. However, growth appears to have accelerated slightly this year. In early Feb, the bank said it had 2 million mobile banking customers; so in the past 5.5 month, growth has been just under 150,000 new users per month. The bank has a 60% market share in online bill payment; an amazing penetration for a bank with 12% of the country’s deposits. 1. See our Online Banking Report: The Demise of the Branch (April 2006), for more on the long-term trends in the mix of branch and alternative delivery. TowerGroup has just released a new research note discussing the growing adoption of mobile banking in the United States. The research unit of MasterCard is predicting a five-fold increase in active users (note 1) between year-end 2009 and year-end 2013. In comparison, we (note 2) are projecting a four-fold increase. But either way, it’s a phenomenal growth curve reflecting a market that financial institutions must pay attention to. Following are the numbers Tower released; more details are contained in the full report (purchase here). I also compared to those that we projected in our Jan 17 Online Banking Report. Please note: TowerGroup forecasts active USERS; we forecast active HOUSEHOLDS. There are about 1.9 adults (18+) per household in the United States, but often, not all of the adults in the household are active banking users, so it’s a bit hard to compare the two figures. But if you assume 1.2 to 1.4 mobile banking users per household (note 3), we are pretty close this year, but TowerGroup is a bit more bullish five years out. 1. Active mobile users have used the service within the past 90 days. 2. 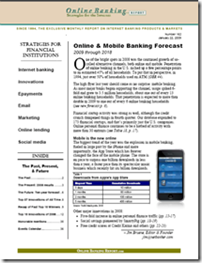 See our Online Banking Report: Mobile and Online Banking Forecast or the Online Banking Report: Banking on the iPhone for complete details. 3. We assume the number of mobile users per household will grow over time starting with 1.2 per household in 2009 to 1.4 per household in 2013.